Sensational questions ranging from Rockney to The Riddler. The Picture Round is name the most Popular Apps from 2016 and the Wild Card Question is a length estimate of an animal from Peru’s Nazca Lines. Q02. What is of special interest to a heliologist? Q16. Which one of the Rockney duo Chas and Dave usually plays the piano? Q24. What is the final event on day two of the women’s Heptathlon? Q33. In the 1995 film Batman Forever who played The Riddler? Here’s a low-res sample of the most Popular Apps from 2016 Picture Round, click for a higher resolution version. The Picture Round download is a two page high quality PDF with the answers on page two. 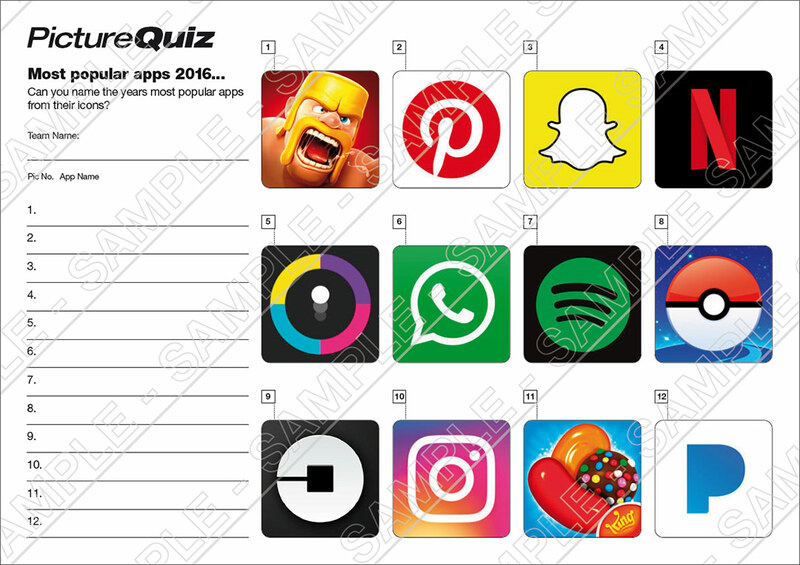 The Quiz 68 Picture Round is can you name the most Popular Apps in 2016 from their icons? The Wild Card Question for Quiz 068 is a length estimate of an animal from Peru’s Nazca Lines.